"My goals were met and I came back surprised and impressed by how modern and progressive Turkey is...my expectations were totally different and beyond what I had read about this country. Must go back!" Day 1  International flight to Istanbul, Turkey. Day 2  Arrive in Istanbul. Transfer to our boutique hotel in the heart of the “Old City” within walking distance of Istanbul’s main attractions. We will have a team meeting in the evening. Day 3  A day for sightseeing in Istanbul. 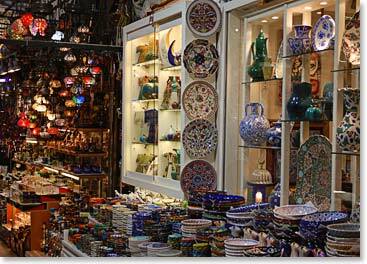 Today we will take a walking tour of Istanbul’s Sultanahmet – the center of the “Old City”. The first stop will be the Blue Mosque, a beautiful 17th century mosque named for its 20,000 blue Iznik tiles and famous due to the presence of six minarets instead of the standard four. Next we will visit the Hagia Sofia, one of the greatest works of Byzantine architecture. We will then pass the Hippodrome, the ancient center of sports and entertainment, on our way to the Grand Bazaar, the biggest “souk” in the world with nearly 4000 shops. If we still have some energy after shopping and exploring the Grand Bazaar, we can visit the Topkapi Palace and walk through the Spice Bazaar to take in the enchanting aroma of the vast array of spices sold there. Day 4  We will take a morning flight to Kaiseri, the gateway to the Cappadocia, a region in Central Turkey where nature and history have come together to create some of the most beautiful scenery in the world. The most distinctive characteristic of the region is the abundance of “fairy chimneys”, or as we call them in North America, “hoodoos”, which formed as the volcanic landscape eroded away leaving behind isolated pinnacles of rock. Early civilizations used the unique landforms to their advantage by carving dwellings, storage facilities and churches right into the rock. Some cities were even carved out entirely underground. Local rock was historically the only construction material of the region and is still used today. In fact, our hotel is carved out of the rock! 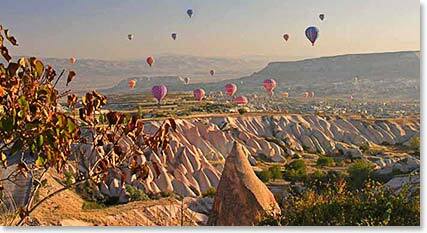 Day 5  Up in the early morning we will drive on our way to the launch point for the balloon ride over Cappadocia. The balloon ride is optional and involves a supplemental charge. The ride is an unforgettable experience, but if you choose not to go, we will all be back together by 9am when we will explore the wonders of Cappadocia. Our first stop will be at the multilevel, underground city of Kaymakli. Underground cities were common in the region between the 6th and 7th centuries when Byzantine Christians were often under attack from neighbouring armies. It is estimated that 3000 people lived in Kaymakli and sometimes they would need to stay underground for months at a time before it was safe to travel above ground again. In the afternoon we will explore the region and venture into the hills for a hike. The rolling trails will offer spectacular views of the interesting landforms and cave dwellings of the region. Breakfast included. Day 6  We will depart the hotel in the early morning hours. Our destination is the remote and mysterious Taurus Mountains, birthplace of Saint Paul. 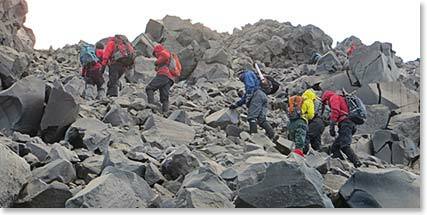 We will acclimatize and test our gear on a hike in Ala Daglar National Park. This will allow us to climb through Cimbar Vadisi, one of the wildest and most scenic slots canyons we have visited anywhere in the world. Day 7  Today we depart Kaiseri on a flight to the city of Van. From there we will transfer to the town of Doğubeyazit which takes approximately 3hrs.. The drive will be scenic and pleasant. Along the way, we will take a short break at the Muradiye Waterfalls to enjoy a cup of Turkish tea and stretch our legs. After we check in to our hotel, we will pack our bags for the climb. Personal items and clothes that you do not need for the climb can be stored at the hotel. For dinner we will head to a local restaurant where we will enjoy Kebaps and other traditional eastern Turkish dishes. Day 8  The climb begins today. 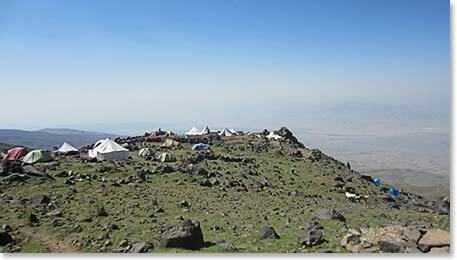 After breakfast at the hotel, we transfer 40 minutes by minibus to Mount Ararat. We will unload at 7,250ft/2,209m and begin our hike. Our expedition duffel bags will be taken up the mountain by horses. We will see them again at camp I, at 10,850ft/3,340m. It will take us between 3 and 5 hours to reach camp I. On the way up the mountain, we will be able to observe the way of life of the nomadic peoples who herd their animals along the lower slopes of the mountain. Breakfast, lunch and dinner included on the climb. Day 9  This is our acclimatization day on the mountain. 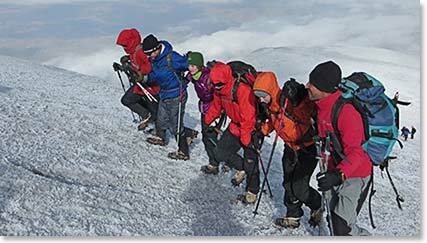 We will trek up the mountain to an altitude of at least 13,150ft/4,010m then return to Camp I to sleep. By climbing high and then returning to a lower altitude to sleep, we are allowing our bodies to acclimatize in preparation for our move up the mountain. Total trekking time today will range between 4 and 6 hours. Day 10  Today we will move up the south ridge of the mountain to our High Camp at 13,450ft/4,100m. 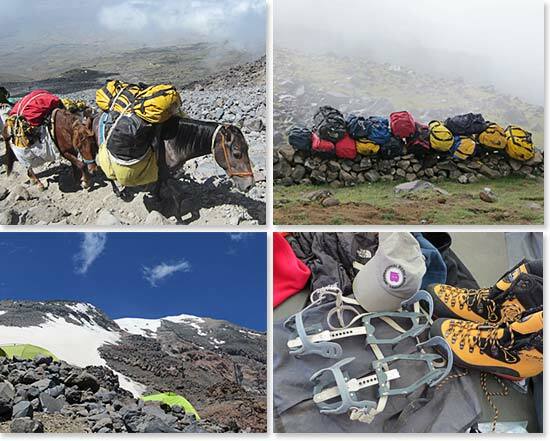 Horses will carry all our gear to High Camp and climbers will only carry light day packs. 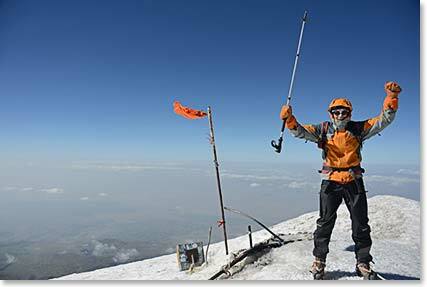 The total trekking time will by 4-6 hours. We will use extra time in the afternoon to adjust crampons and rest for our summit attempt. Day 11  Summit Day. We will wake-up very early for an alpine start on the mountain. After a big breakfast in our dining tent, we will start our climb to the summit before dawn. Our day will be long but rewarding. We will descend back to Camp I for a night of rest. The summit attempt and descent should take between 10 and 12 hours today. Day 12  Feeling rested in the morning, we will pack up and descend the mountain. Our vehicle will meet us and bring us back to Doğubeyazit for lunch. After lunch, we will visit the monumental Ishak Pasha Palace, a 17th century Ottoman gem and we may have time at the end of the day to enjoy a demonstration of the ancient craft of carpet weaving. If necessary in case of bad weather, this day may be used as an alternate summit day. In this case, we walk all the way down from the summit point. Day 13  Today we return to Istanbul. After an early morning breakfast, we will drive to the Van airport for the flight to Istanbul. Day 14  International flight home. BAI Trip Ends.